Here we go. If its not bad enough that the hottest sneakers around are released ONLY in Asia, we have sneaker companies like Nike who continue to be influenced by Japan. Life as a sneaker head would be so much simpler if i just lived in Asia, right? That grudge aside, this sneak is influenced by the fictional Japanese character Ultraman. 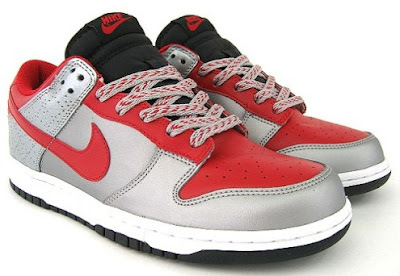 The back sports a metallic silver, with red accents on the heel, toebox and lace holes. 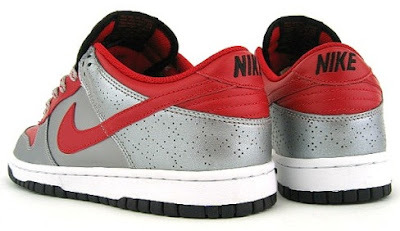 Doesn't this shoe colorway remind you of Ultraman's Suit? Of course it does. No matter how you want to slice it, this shoe looks HOT. As per the case with nearly ALL hot sneakers, this was NOT released in the US to my knowledge. So if you want to cop a pair, go march on over to e-Bay and search for a pair in your size. It should be between $100-200 USD depending on size.